As well as being a demonstration of nationalism and the fact that money can buy gold, the London Olympics gave us the usual advances in human performance. But is there a limit to how fast, high and strong we can get? Sounds like a question for science. It’s a tricky one though: you’d expect there to be restrictions from physiology or mechanics, but we don’t necessarily understand those well enough to draw a line. Plus there’s always the chance of some innovation in technology or technique that pushes those limits further – for example, the Fosbury flop in the high jump. But the other way to tackle the problem is to look at the statistics and see whether records are approaching a limit, which is just what Spanish physicist Filippo Radicchi from the Universitat Rovira i Virgili has done (Radicchi F 2012, “Universality, limits and predictability of gold-medal performances at the Olympic Games”, PLoS ONE, vol. 7, no. 7, e40335, doi:10.1371/journal.pone.0040335). Radicchi looked at medal-winning performances from previous Olympics and showed that they followed a normal distribution relative to each other, which implies that they can be considered to be exponentially approaching a future limit or asymptote. Looking at the rate they’re approaching this limit also enables a prediction for each future Olympic Games. As an example, we’ll look at the big one, the men’s 100 metre sprint. Radicchi’s calculations, published on 12 July 2012, predicted a time of 9.63±0.13 seconds for the London Olympics. On 5 August 2012, Usain Bolt won the gold medal in this event with a winning time of… 9.63 seconds. Unfortunately, Radicchi says that some of the early data for these shorter events is unreliable, so calculating the ultimate limit is a bit tricky. The unadulterated calculations give an estimate of 8.28 seconds. But discarding some of the dodgier figures – blame them on less sophisticated timing techniques – a more conservative figure is 8.80 seconds. Compare that with Usain Bolt’s own 2009 world record time of 9.58 seconds. Even with the conservative estimate, the limit is still a while off. At each successive Olympics the advances are expected to be smaller and smaller, meaning breaking records will get less and less likely. Eventually, we’ll reach the limit of not only human ability, but reasonable comparison between events, when you take into account things like weather conditions or even the accuracy of the length of the track. But at least Radicchi’s predictions suggest we haven’t quite reached those limits. So if you’re an athlete with world record aspirations, don’t give up just yet. 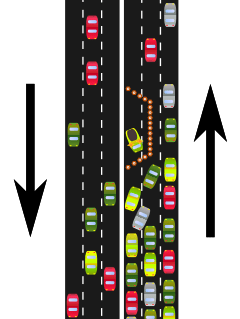 Traffic can be difficult to model mathematically, comprising as it does thousands of drivers in metal boxes making their own decisions and moving in a coordinated – or uncoordinated – fashion. But at the risk of over-simplifying things, it can be instructive to treat certain road conditions as a fluid. Consider bottlenecks, where a blockage reduces multiple lanes of traffic down to one. In the diagram above, roadworks have forced all the cars from three lanes into one. The restriction of the single lane determines how many cars can pass through the entire section of road in any period of time. Since cars can’t magically appear or disappear, they must be going into the blockage at the same rate – if you like, we can call this the conservation of cars. But because the three lanes mean there are three times as many cars going in, to satisfy the law of conservation of cars, they must be moving at one third the speed. This may seem counter-intuitive, after all we normally assume that wider roads make traffic move faster. But you’ve probably observed the effect yourself when you encounter roadworks. It implies that widening roads won’t help if there’s some form of limiting factor, like an exit to a freeway. Adding more lanes to the diagram above will only cut the speed further. This same principle applies to fluids, except it’s not conservation of cars, it’s more like conservation of mass. And the overall rule is called the continuity principle. You can easily see the continuity principle in action in your home: for instance, water coming out of a tap accelerates under gravity, so when it’s moving faster the cross-sectional area has to reduce to keep the rate of flow the same. Which is why the stream narrows further from the tap. Or for another example, when you put your thumb over the end of a hose you restrict the area it can flow through, and so the water moves faster – and you can squirt the water further. But as a final interesting twist, there is a maximum speed you can reach by reducing the area like this: thanks to Bernouilli’s principle, increasing the speed of flow also reduces the pressure. And eventually the pressure gets so low that the water can actually boil at room temperature. This is what sets the maximum speed: it’s known as choked flow. And this room temperature boiling, with bubbles of vapour forming and collapsing, is the cause of the characteristic hissing noise of taps. And that’s what freeway construction and roadblocks have to do with noisy plumbing! Following the release of the most recent Victoria Police crime statistics, there’s been a lot of attention on doing something about the state’s “culture of violence”. Overall crime has dropped by 6.4% from 2008/09 to 2009/10, but in the same period the number of assaults has risen by 3.8%. But is this what the numbers really say? Are beer barns and young hooligans the real problem, or is something else going on? 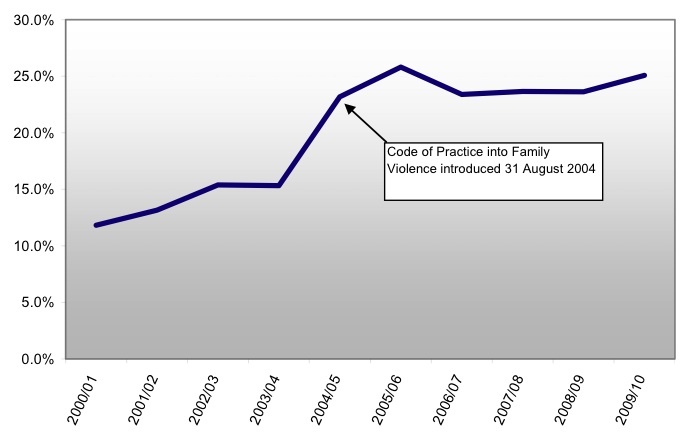 Well, it’s pretty clear from the reports that the big rise in assaults is due to family violence, in particular violence against women.